Last night while live blogging from the World Series of Poker’s Event No. 34, that $1,500 No-Limit Hold’em event that got underway yesterday, I became increasingly aware of an interesting phenomenon related to the business of WSOP event reporting. Yeah, I’m talking about the Twitter thing again. Hear me out, though. And tell me what you think. Aside from the many massage therapists, dealers, and tournament officials who constantly pass to and fro between the tables, yesterday there were relatively few of us there officially “covering” the event. That’s usually the case. PokerNews isn’t the only media outlet there covering WSOP tourneys, of course, but relatively speaking there aren’t a ton of people running around with notepads and cameras chronicling what’s going on. Which given the space limitations and the need to keep things comfortable for the players is probably a good thing. That said, it was interesting last night to observe how there was, in fact, a big crowd of reporters sending news to the world about what was happening at the Rio. Most of them were not wearing credentials attached to lanyards hung around their necks, but they were nevertheless there legitimately, getting the info out about hands, chip counts, and other matters in a timely fashion. Who am I talking about? The players, of course. There were 2,095 entered into Event No. 34, and it seemed like at least half of them were also reporting on the event, too, via their iPhones, Blackberries, and other electronic devices with which they were able to access the internet and send their missives to the outside world. Now I’ve always been conscious of the fact that when I write the posts that appear on the PokerNews live blog, there are others writing accounts about the same thing -- even the exact same hands -- that appear on other sites, in the forums, and elsewhere. Last night was a little different, though. On the PokerNews’ live reporting page for a given event, we have running alongside the live blog something called the “Shout Box” where registered users can comment. That was put on the site last summer. This year PN has added another feature, something called “Star Tweet Tracker” that runs in a third column on the right side of the page. 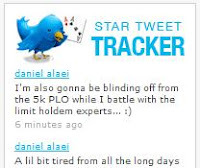 That appears to work something like the “Twitter Updates” page over on PokerRoad site -- a compilation of various Twitter feeds from poker players that gets automatically updated whenever a player who has been included as a “Star” sends out another tweet. It was kind of humorous, really. I’d report hands played by Phil Hellmuth, Vanessa Rousso, Jeff Madsen, David Chicotsky, and Allen Cunningham, and their own reports would appear alongside mine -- sometimes a minute or two before, sometimes afterwards. And every now and then there was some reporting happening in the Shoutbox, too, so we’d get three versions right there on the same page. How do I feel about all the fact that there are “competing” versions of the story I’m reporting not only appearing elsewhere on the web, but on the very same page where I’m writing? Do I feel as though my role as a reporter is somehow being usurped? That what I’m doing is relatively less significant or vital because of the presence of all of these other reports? Hardly. In fact, I think it’s pretty cool. Gonna try not to go too deep into it here, but I will mention a couple of reasons why I like the players’ reports getting out there along with my own. One is how it helps on the accuracy front. We sometimes will find it necessary to ask players -- if it is feasible to do so without bothering them too greatly -- for details about hands we are trying to report. Players sending out tweets on their own function as answers to such questions (if we have them) without our having to ask them. I also think there are fairly significant differences, still, between tweeting and blogging. Obviously the length restriction (to 140 characters) for a tweet is significant. But that’s not the most important distinction between the two, I’d say. No, the bigger difference has to do with the relative “permanence” of each. Tweets go away, while the blog does not. One can, of course, go back and read old tweets, but that is rarely done. The fact is, Twitter is especially good at reporting the present, but doesn’t really have much to do with the past. But the “tweets” themselves aren’t sufficient on their own. Their brevity means they generally lack sufficient context. They are almost always strictly “first-hand” reports, i.e., they contain a level of subjectivity that has to be taken into account for those using them to fashion their own reports according to usual journalistic standards (which generally requires at least an attempt to be objective). And they aren’t written for the future, but for the present. They are transitory. They go away. They have to be rewritten in a way that will allow these messages to live beyond the moment in which they were first composed. Future historians of the disputed elections in Iran will no doubt use the “tweets” and other source material to construct their accounts, just as historians in the past used interviews and other eyewitness accounts to write their histories. 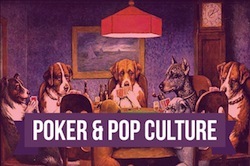 Poker reporting, too, will find more ways to use these player reports and incorporate them not only into “live” reports but into subsequently written historical accounts of events. For now, though, I’m going to say that I think there’s definitely value in having all of these different perspectives, which in the end add a richness to the “story” of what is happening that may otherwise be missing. Keep following the story (or stories) over on PokerNews’ live reporting page. 'All things become clear in time' while cliche is also true. I am sure that in time folks will find a way to pervert twitter and the down side of the medium will surface. It is fascinating to watch all the different social media become incorporated into our daily lives and change the way we relate and communicate with each other. 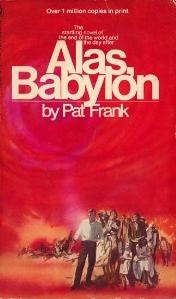 For good or evil we live interesting times.